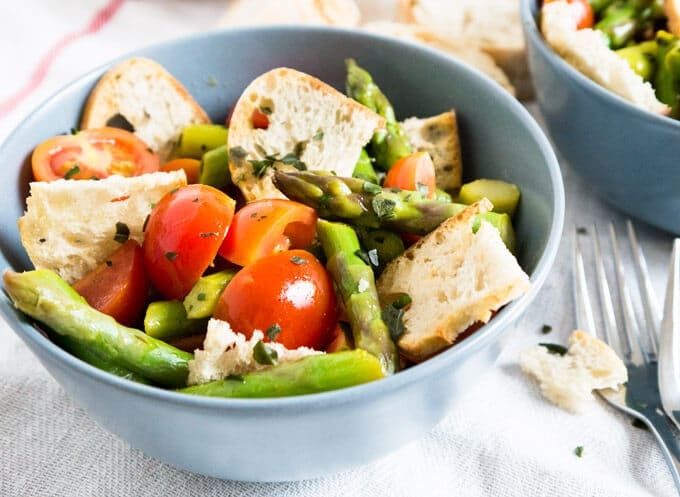 Asparagus Panzanella is made with sweet cherry tomatoes, crispy homemade ciabatta bread chips, and green asparagus! 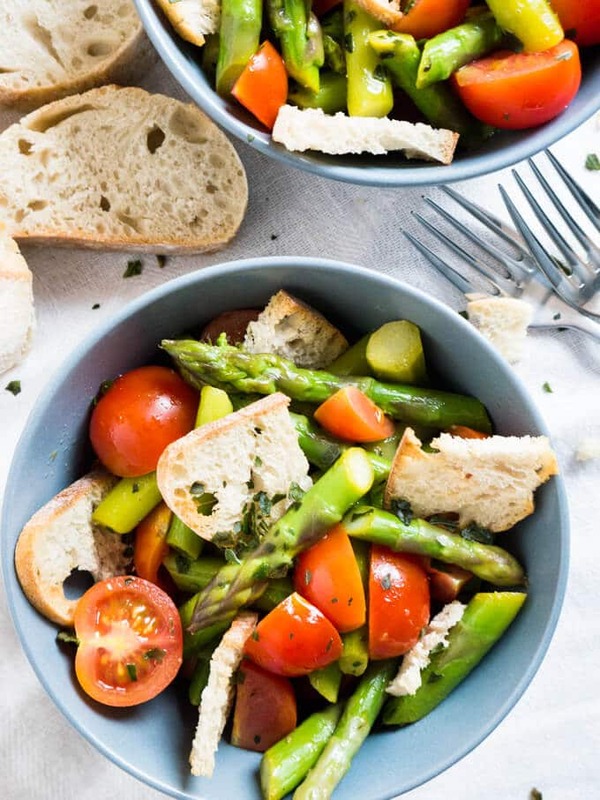 A perfect salad recipe for spring. Spring time means asparagus time! Where we live there is only a short period of time where you can get fresh regional asparagus. Our home region, Franconia, is famous for its white asparagus which grows under the earth and tastes different than the green asparagus. But I have to admit at home I prefer cooking with green asparagus because it’s easier to handle! Most of the time, chances are, that your store-bought green asparagus is ready to go without being peeled. But if your bunch is a bit tough and fibrous at the end I recommend peeling the lower third. It’s much easier to peel than white asparagus, which is really a pain in the b** to peel. So green asparagus is definitely the way to go at home for me! 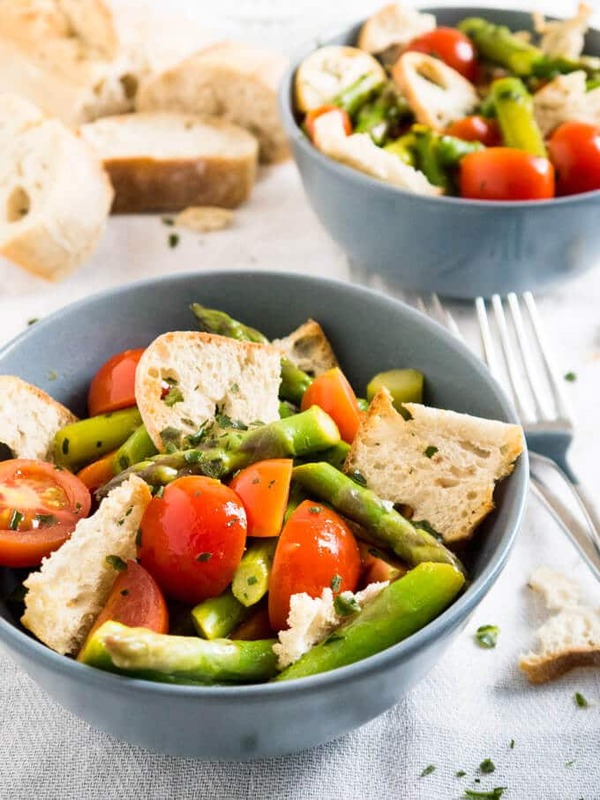 It’s a great addition to spring salads like this Asparagus Garlic Bread Salad which is a great way to have your bread in your salad and not as a boring side. We went to Prague a few weeks ago and there they served this delicious roasted garlic bread. Peter had it almost 3 times a day and so had I because you know it’s not good if only one eats garlic. It was so tasty! 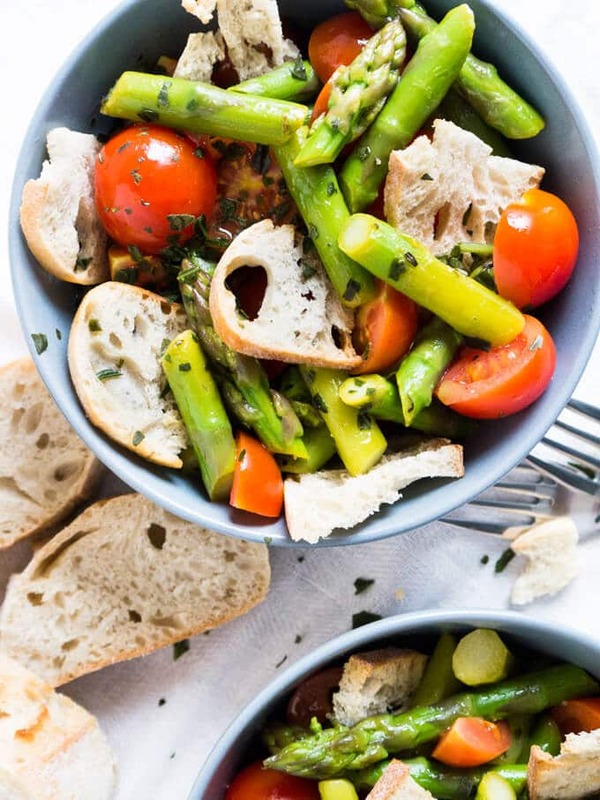 For this salad, I made my own version using a ciabatta loaf. I cut it into fine slices and roasted them in the oven. 3 minutes later they were crispy and golden and I immediately rubbed them with a garlic clove. They were so good, you could eat them without the salad! 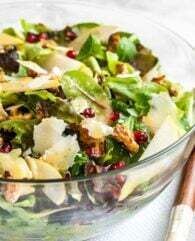 This salad makes a great lunch or dinner! 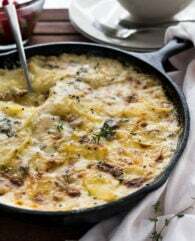 And if you want to serve this salad as a side, Grilled Chicken or my Easy Vegetarian Spinach Lasagna would make a great main dish. 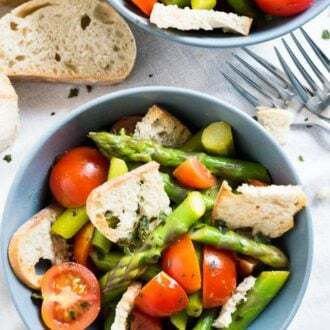 Asparagus Panzanella is made with sweet cherry tomatoes, crispy homemade ciabatta bread chips, and green asparagus! A perfect recipe for spring. Preheat your oven to 400F (200C). Cut the bread into very thin slices and spread the slices in one layer out on a baking rack. Put the baking rack into the hot oven and bake for 3 to 4 minutes until crispy. Peel and cut the garlic clove in half. Rub with the garlic halves over the crispy bread. Set aside. Wash and dry your green asparagus. Cut off the ends, peel the lower third, and cut the asparagus into 1.5-inch pieces. In a small pot bring water to a boil, add 1/2 tsp salt and add the asparagus. Cook it for 3 minutes until it is al dente. Drain and rinse with cold water to stop the cooking process. Wash and cut the tomatoes into halves. Put them with the asparagus in a big serving bowl. 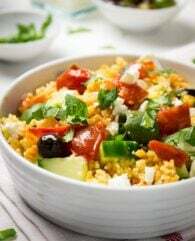 To make the dressing, put vinegar, olive oil, and agave syrup or honey in a screw-top jar. Shake the jar until combined and season the dressing with salt and pepper. Add the dressing to the tomatoes and asparagus. Pick the basil leaves from the stalks, chop them coarsely, and add them to the salad. Just before serving add the garlic bread chips. Enjoy!